Protocol 1000 Plus requires the addition of DMSO (dimethyl sulfoxide) to your hourly dosing. Before proceeding with this protocol, please thoroughly read and/or familiarize yourself with Chapter 4 in the Health Recovery Manual. This protocol is simply adding DMSO to the MMS1 Protocol 1000 dose which is 3 activated drops per hour (or sometimes less). 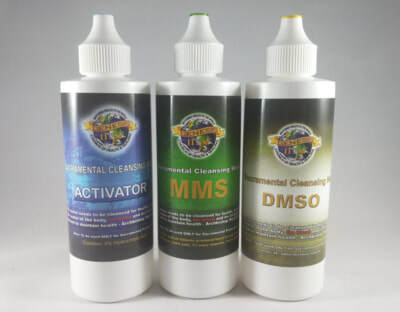 With Protocol 1000 Plus, you add in 3 drops of DMSO for each drop of MMS. Or, in case you have not progressed to 3 drops an hour by this time, continue the same amount of MMS1 you’ve been taking and add in the DMSO accordingly. For example, if you are taking a 3-drop dose of MMS1, you would add 9 drops of DMSO. If you are taking a 2-drop dose of MMS1, you would add 6 drops of DMSO. Add 1/2 cup (4 ounces/120 ml) of water (or compatible liquid; see pages 42-45, 56). Drink down the dose immediately as once the DMSO is added the MMS1 will begin to slowly lose potency if left to sit. If after adding DMSO to your dose you experience discomfort (such as nausea, diarrhea, etc. ), reduce the amount of DMSO you are adding on the next dose. Instead of adding 3 drops of DMSO per 1 drop of MMS1, reduce to 2 drops of DMSO to 1 drop of MMS1. If you still have discomfort, reduce the DMSO by another drop, in other words, use 1 drop of DMSO per 1 drop of MMS1. If you still experience discomfort after reducing the amount of DMSO 2 times, then completely stop adding DMSO to your MMS1 doses for a day. Then start back with small doses of DMSO and build up slowly to 3 drops of DMSO per 1 drop of MMS1. An important reason to drink the MMS1/DMSO dose immediately is because DMSO begins to cause the dose to slowly lose its potency. It takes up to six hours to lose full potency; nevertheless, it is best to drink it straight away so it doesn’t lose any of its power. I suggest drinking it within one minute of adding DMSO drops, because it loses a large amount of potency in the first ten minutes and then continues to lose potency at a slower pace. When progressing from Protocol 1000 Plus to Protocol 2000, always continue using DMSO according to the instructions given here in Protocol 1000 Plus while doing Protocol 2000, i.e. always add 3 drops of DMSO to the dose for every 1 drop of MMS1.